The facile synthesis of single atom catalysts (SACs) or atomically dispersed catalysts have attracted more and more attention. Wet-chemistry methods have been applied to synthesize metal SACs, and one significant challenge is to avoid the aggregation of atom in solution synthesis to form nuclei and nanoparticles. According to the nucleation theory, the nuclei formation and growth represent the first stages undertaken by the products species, stepping over an energy barrier to aggregate as precipitate. An interesting and important question we considered is how different the products will be when solution reactions run at lower and lower temperatures. 1. Thermodynamic and kinetic control to obtain atomically dispersed catalysts in solution. By using water/alcohol mixed solvent system to provide low freezing-point of the reaction system, they successfully conducted a serious of solution synthesis at an ultralow temperature of -60 oC. 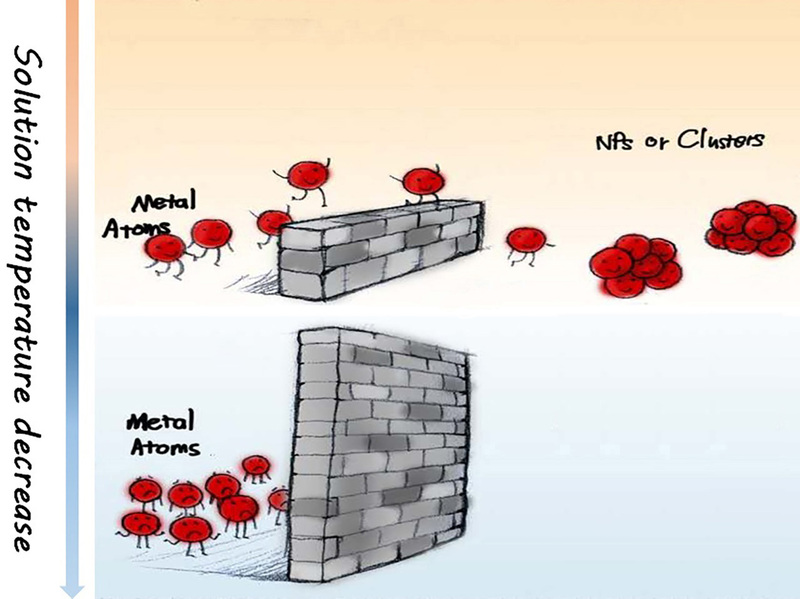 Taking advantages of significant higher energy barrier and sluggish nucleation rate at such low temperatures, stable atomically dispersed metals in solution without nuclei formation was achieved. The low temperature synthesis provide a general and fundamental strategy to synthesis single atom catalysts. 2. Superior performance for ORR electrocatalysis. Single atom Co catalysts on nitrogen-doped mesoporous carbon (NMC) substrates can be synthesized at -60oC, and such materials presented superior catalytic activities and stabilities in both alkaline and neutral electrolytes, superior to the state-of-the-art commercial platinum/carbon catalyst and other previously reported non-precious catalysts. The onset potential and half-wave potential values of our Co catalysts were 62 mV and 39 mV more positive than that of Pt/C catalyst in alkaline electrolyte. 3. Superior performance in full fuel cell devices. They further applied the atomically dispersed Co catalysts in practical microbial fuel cells (MFCs) devices. The cell outputs a maximum power density of 2550 ± 60 mW m-2, with no current drop operated for 820 h.
The novel low-temperature solution synthesis not only provide a new generalized method to redesign reaction kinetics and thermodynamics by controlling the nuclei formation and growth behavior in wet chemistry process, but also open up new possibilities for the nucleation understanding in solution reactions and the fabrication of high performance catalyst materials using conventional solution chemical method.